AT&T investors could be in for a rude surprise if any of these three negative catalysts are triggered. AT&T headquarters in Dallas, TX. Source: Wikimedia Commons. What's stopping AT&T (NYSE:T) shares from rising to the sky? Recently, I took a look at three reasons AT&T's stock could rise in the foreseeable future. But it's not all sun and blue skies ahead for Ma Bell. Today, I'll share the three biggest reasons AT&T shares could move in the opposite direction. The biggest reason to be optimistic about AT&T right now is the pending buyout of satellite broadcaster DirecTV (NYSE:DTV.DL). If approved and executed, the deal will add international growth, diversify AT&T's domestic business, and boost AT&T's annual cash flows. Taken together, these benefits make it a game-changer that could add about $4 billion to AT&T's annual free cash flows. The company generated about $14 billion of free cash in 2013, so DirecTV is poised to provide 29% boost to the cash-based bottom line. And that's before you consider the potential for revenue growth in South and Central America, where DirecTV is a serious presence -- and AT&T is not. This deal alone can keep AT&T's growth going for years to come, even if the company can't find any other business catalysts. On the flipside, it's a serious business risk. If regulators or shareholders put the kibosh on AT&T's DirecTV buyout, the company will miss out on all of these benefits. It could be worse. The $49 billion deal does not come with a breakup fee, in contrast to the $6 billion fee that AT&T paid to T-Mobile (NASDAQ:TMUS) when that proposed deal fell through in 2011. Once bitten, twice shy -- AT&T will not feel that would burn again. Still, the company and its investors are banking on the DirecTV deal. Losing this potentially huge package of catalysts would be terrible for AT&T's business fundamentals, not to mention its share prices. Original sources: AT&T and DirecTV. What if the DirecTV deal is approved, but AT&T fails to deliver on its promises? Expanding south of the border won't be easy, even with DirecTV's head start. Keep in mind AT&T is a huge and potentially multinational giant already, with assets to match. Even so, the company has not felt confident enough to start a serious push outside U.S. borders. In 2013, AT&T's non-U.S. interests were too small to show up as a separate geographical division in company filings. A partnership with Latin American wireless operator America Movil added just $532 million to AT&T's operating income last year -- a mere 1.7% of the American telecom's $30.5 billion operating profits. So, it's not like AT&T has a ton of experience with international growth. That's what DirecTV is supposed to bring to the table. As for the immediate cash flow boosts, it will be easy enough to save $1.6 billion the year in cost cuts and efficiencies, but who's to say DirecTV's cash flows will continue to grow? Yes, DirecTV's cash earnings have spiked in recent quarters. But the company is only back to where it was five years ago. In the meantime, cash flows dried up substantially. 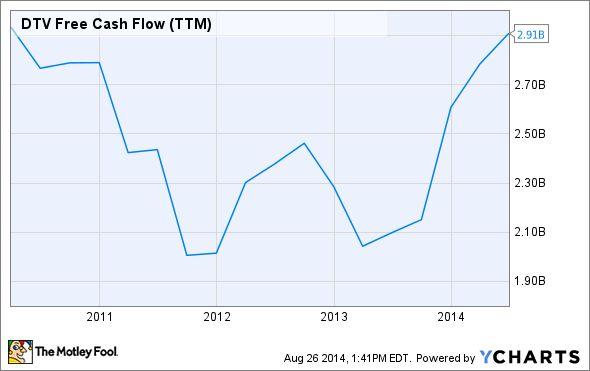 DTV Free Cash Flow (TTM) data by YCharts. The traditional broadcasting business is under attack from online entertainment sources, led by Apple, Amazon.com, and Netflix. Many of the programs that used to keep consumers loyal to their cable or satellite service are also available online nowadays. If Netflix doesn't have your favorite show, maybe Amazon Prime offers it for a similar monthly subscription fee. And if all else fails, Amazon and Apple's iTunes will be happy to sell or rent pretty much anything your heart desires. So, DirecTV and its old-school friends depend on time-sensitive content like news and sports packages. What happens if Amazon or Apple figure out how to sell and deliver live broadcasts online? The trickle of cord-cutters could turn into a torrent, undermining the cash-generating value of a satellite broadcast service. Cable and satellite services may very well become a footnote in TV history in just a few short years. In that case, AT&T will have paid nearly $50 billion for a hollow asset. The smartphone boom is ending, as AT&T and other telecoms saturate their sales channels with smart devices. 77% of AT&T's customers already use a 4G-capable smartphone. So, the battle moves on to the next Next Big Thing. 5G networks are still a few years away, pending another large radio spectrum auction in 2015. Wearable computing might be the next mobile revolution, but nobody has delivered any earth-shaking hit devices in this market yet. Whatever's next, AT&T had better stay on top of the new trend. That's not as easy as it sounds. Smaller operators T-Mobile and Sprint (NYSE:S) are already introducing aggressive pricing plans, jockeying for position in the next mobile era. Following their lead will put pressure on AT&T's profit margins; opting out of the price war will lead to customer defections. AT&T is not powerless. The company has unmatched assets and experienced leadership on hand. But the next few years could be brutal if Ma Bell is dragged into a race to the bottom. Or even worse, if a smaller rival figures out how to ride the next wave of mobile computing better than AT&T does.